I need only stage, screen and radar credits to complete my resume. Aside from however many times I've bamboozled editors into publishing my writing (and there will be another instance this Sunday, thank you) I have now been featured on radio. 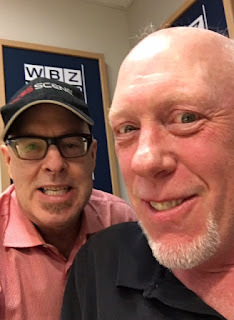 Jay Talkin', the midnight to 5am show hosted by the great Bradley Jay, on WBZ Newsradio 1030 in Boston (and with a reach of 38 different states due to a 50,000 watt clear signal) was where you could have found me on Thursday morning. Bradley Jay to the left, me to the right showing a face that is perfect for radio. If you didn't find me on WBZ - perhaps due to the lateness of the hour and your need to rise at 6 in the morning in order to go to your job making widgets, or perhaps because you live in Alaska - I have good news for you. My hour on the show is available via podcast. As a matter of fact, here it is now! OK, it isn't here, but here's a link to where you can find it. I think I was scintillating, insightful, provocative, even mediocre at times. You can form your own opinion, of course. It would be easier for you to form your own opinion if I knew how to embed the audio here, but - as noted at one point during the interview - I am a neanderthal without even the knowledge that comes from owning a cell phone. You expect me to be able to figure out how to make audio play on a blog? You're lucky you're not reading this on a rock I chiseled. By the way, there was a small piece left out of the podcast, wherein Bradley asked me how I learned to write well. I basically told him I had no idea and I decided to commit professional suicide by professing a stunning ignorance of how words are supposed to, according to Strunk & White, work. Just to prove I wasn't lying, here's my usual sign-off. I used to listen to WBZ at night from the Delaware shore when I was a kid. It was where I first heard Purple Haze. I knew then that these were my people. Your celebrity grows and grows... with good reason! People don't listen to that what they don't like. You must be doing something right sir!